When I noticed the Vietnamese Wok class, I enrolled right away. I constantly crave the exquisite herbaceous and tart flavors of Vietnamese food. Learning how to make it at home seemed like a smart move to save money and impress my husband. Upon arrival, our instructor, Mollie Snyder, talked us through the menu. 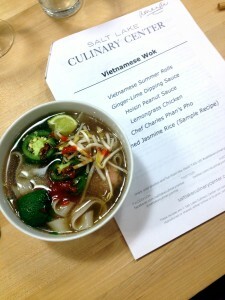 We’d be making Vietnamese Summer Rolls, Lemongrass Chicken and finally, Pho, a traditional Vietnamese soup. After suiting up with aprons and washing our hands, we dove in. The mosaic of flavors in Vietnamese food comes from the combination of many elements. All the sauces and ingredients we needed were neatly laid out before us, organized on red plastic trays. Syder, a classically trained French chef, explained the technique as “mis en place,” or “everything in its place.” Working in teams, we perfected our knife skills on the various ingredients. Once the prep work was done, we started on the rest of the menu. The Vietnamese Summer Rolls were fun to make. After soaking the rice paper in water for a bit, we loaded each piece with Vermicelli noodles, cooked shrimp and a variety of fragrant herbs. Working with the wet, slippery rice paper is tricky, but under the tutelage of Snyder, we were making professional-looking rolls in no time. The most challenging dish we made was Lemongrass Chicken. 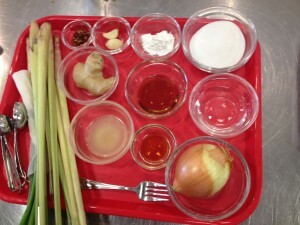 From whacking the fragrant lemongrass stalks against the table, making them pliable enough to chop, to making caramel to add to the sauce, I felt very accomplished upon taking my first bite. The lemongrass, garlic and ginger created layers of complex flavors, sweet and savory with a zing. I’ve never made anything so delicious! The pho we prepared was different than the pho I’ve ordered in restaurants, more of a straightforward recipe ideal for home cooks. We used Snyder’s favorite recipe from Chef Charles Phan of San Francisco’s Slanted Door. The broth was made with beef stock, fish sauce and flavored with plenty of green onions rather than a myriad of spices I’d never have at home. We assembled our bowls with a layer of rice noodles and a thin slice of rare brisket, then gently ladled the broth over it. The steaming, hot broth cooked the brisket as we topped the pho with traditional garnishes such as fresh lime wedges, Thai basil, bean sprouts, jalapeno, Sriracha and Hoisin sauces. As we sat around the dinner table slurping noodles and enjoying our meal, we mused at how easy the meal was to prepare. “The absolute basis of my love of teaching people to cook is truly about teaching people to eat,” stated Snyder. 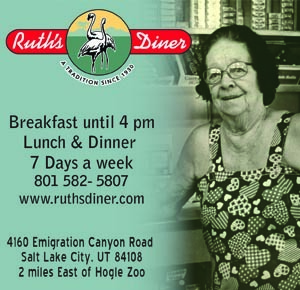 The Salt Lake Culinary Center is located at 2233 South 300 East in Salt Lake City. 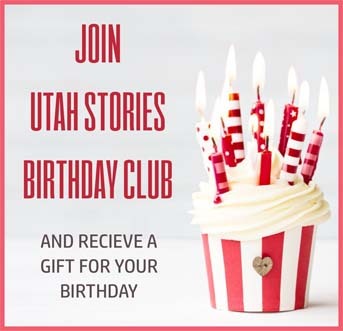 Visit www.saltlakeculinarycenter.com to peruse their classes.